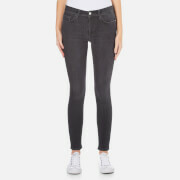 Women's 'Rebound' skinny jeans from French Connection with a body-contouring, stretch cotton construction. Showcasing a classic five pocket design and faded finish, the denim jeans feature a metallic button closure, zip fly and belt loops. Tonal stitching throughout. 92% Cotton, 6% Polyester, 2% Elastane Model is 178cm/5'10 and wears a size UK 8.